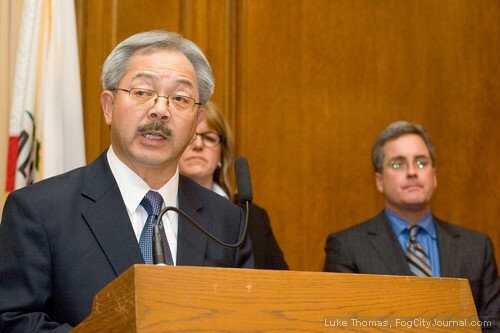 Mayor Ed Lee wants everyone to know that he told the truth when he testified before the Ethics Commission. Not that he never talked to any supervisors about the Mirkarimi case, or gave a wink to a back channel offer to Mirkarimi as is now alleged. That’s still an open question. No, I believe him when he testified under oath that he has the authority to ignore official misconduct even in cases of a criminal conviction. I call it the Lee Doctrine, but you can call it the Crony Rule. If you’re tight with the mayor, no worries even if you otherwise would be charged with official misconduct. You might have missed that part of his testimony, although Mirkarimi’s attorney Shepard Kopp did his best to have Mayor Lee explain himself. “You have the discretion to decide whether you are going to attempt to remove someone or not,” Mirkarimi attorney Shepard Kopp asked Lee. “Is it your position that every public official who is convicted of a criminal offense is guilty of official misconduct,” was the follow-up question. “I think it is a case by case basis,” answered Lee. Got that? Even in the case of a criminal conviction, the mayor might still let you off. So, in language that the rest of the English-speaking world uses, discretion means that you can decide to do nothing even when official misconduct occurs. It might seem a leap to claim that the Lee Doctrine is an open door for cronyism, claiming a mayoral prerogative that no mayor in history ever claimed before. Except for two points that our mayor also offered under oath. First, he testified that he has no written policy on when he might – or might not – bring charges. Second, he testified that he hadn’t given any consideration about applying the Lee Doctrine before bringing charges against Mirkarimi. If ever there were an occasion to bring official misconduct charges against a city official, it was the case of a ranking city official who illegally misappropriated taxpayer funds, forced city contractors to perform campaign duties while paying them with city funds, and engaged in illegal political activities. All that was spelled out in a lengthy city attorney investigation in 2004 with the results turned over to Ed Lee, who was the boss of Mohammed Nuru, the official identified in the investigation. City Attorney Dennis Herrera, a mayoral candidate last year as was Lee, did not hold back about what he found wrong with promoting Nuru given this record. If Nuru is the Lee Doctrine at work – and I believe it is – not everyone should expect to benefit from its existence. That includes City Attorney Dennis Herrera, the man now representing Lee before the Ethics Commission. Mirkarimi attorney Shepard Kopp asked about that. “During that campaign, his [Herrera’s] campaign accused your campaign of the various violations of campaign financing laws, right?” Shepard Kopp quizzed Lee. “Here he is representing you in these proceedings. Evidently, he has mended whatever fences needed to be amended, right?” continued Kopp. After all, as Lee testified, it all comes down to a case-by-case basis.